I always found wearable electronics to be very interesting. Not only do they have to fulfill their function as an electronic device, but they also have to withstand the abuse of fabrics, water, flexibility, stretching, and wear and tear. I saw it as a challenge to create these things, and in the process create the fantasies of back to the future 2. 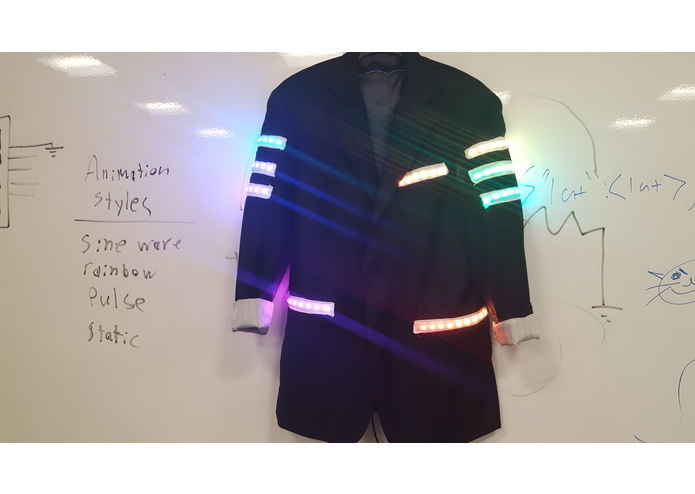 It is a suit jacket with built in programmable micro-controller and buttons. They allow you to cycle through different animations to find one that fits your surroundings. When the lights are powered off, it just looks like a cool suit jacket. First i designed where I wanted the LEDs to be placed so that it would not look tacky. I sewed in an Adafruit Flora micro-controller and started to glue down the flexible LED strips with E6000. I meticulously ran multiple wires to each led strip, and spent hours sewing them to the jacket so they would not catch on anything. I next soldered the wires to the LEDs and reinforced the joint with E6000 and some thread. 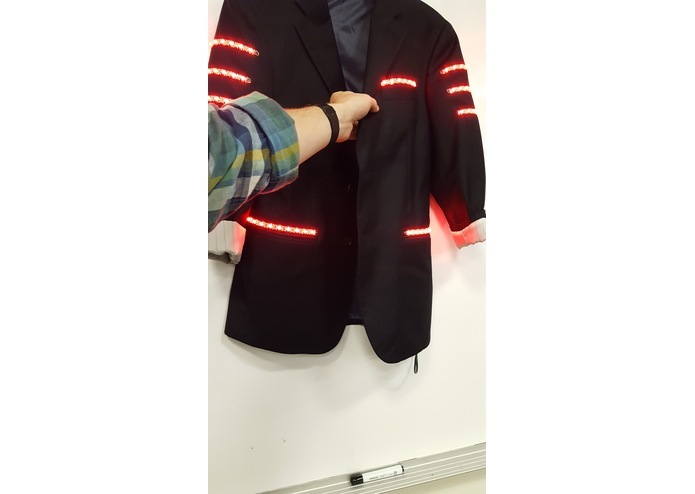 Once the Jacket was wired up, I started to design some of the animations in the arduino development environment. 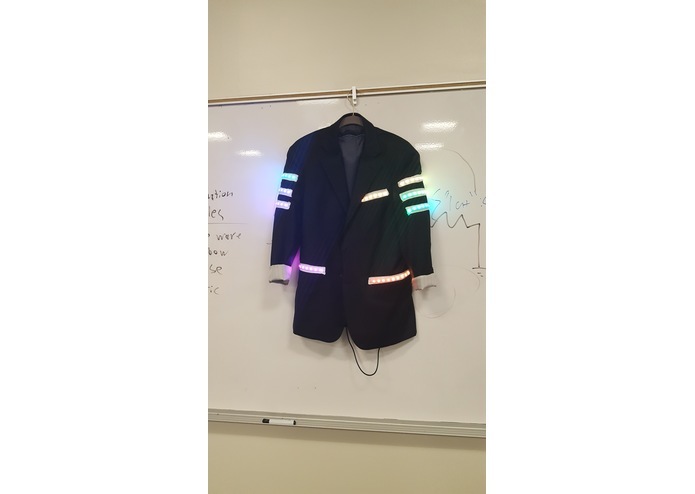 Once I felt comfortable with how the jacket was working, I covered the LEDs in a light diffusing fabric to make them less garish. I fried one of my Flora boards by soldering the power and ground together, when I plugged it in, there was a release of magic smoke, and then the board was dead. I also hand sewed in all the wires. That took way longer than I wanted, and I wish I had a sewing machine. I have been able to wear it around, and have not had any difficult with broken solder joints, or any short circuits when moving around. I even had someone come up to me and ask where I bought it, which to me meant that it looked professional enough to be found in a store. get the correct color wire, so you don't accidentally short power and ground. Do not modify circuits while tired. I was thinking of maybe adding a light sensor or a microphone, so it can respond to changes in the environment around it.